The Beauty of Life: My Recent Mani: Disney Princess Nails Inspired by Cinderella! My Recent Mani: Disney Princess Nails Inspired by Cinderella! I am beyond excited about my current manicure. My family is off to Disney World tomorrow to celebrate my mom's birthday, and I simply had to do a manicure inspired by the Disney Princesses. And what better Disney Princess to choose than the most iconic one of all, Cinderella? My friend Daniella and I had been talking about her doing my nails for awhile (she's an incredible nail artist whose nails always look incredible) -- and, finally, we set a date. Now, you might think choosing a design for a manicure like this would be easy. Well, you would be wrong! Daniella and I emailed, texted and IMed back and forth for days trying to decide on the perfect design. It was actually difficult to decide which character to do -- Belle, Ariel, Rapunzel and even Tinkerbell were thrown into the mix before we decided on Cinderella. One thing we didn't want was for the manicure to look cheesy -- so we immediately threw out the idea of painting faces or dresses on my nails. 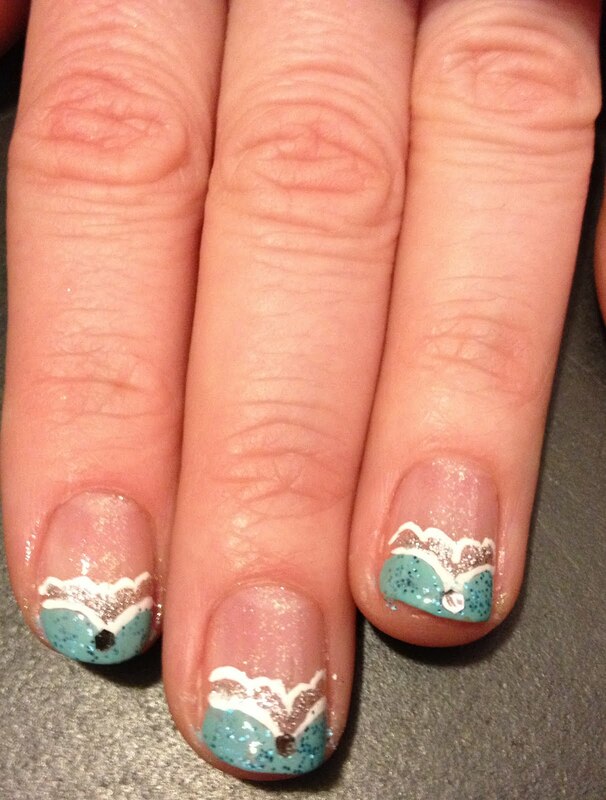 1) We started with one coat of CND Teal Sparkle as the base. We liked that it added some shimmer but wouldn't overwhelm the overall design. 2) Daniella freehanded the French tips using one coat of China Glaze For Audrey. We tried mixing different blues with white first, but finally decided that this Tiffany box blue on its own would suffice. 3) The real fun began! 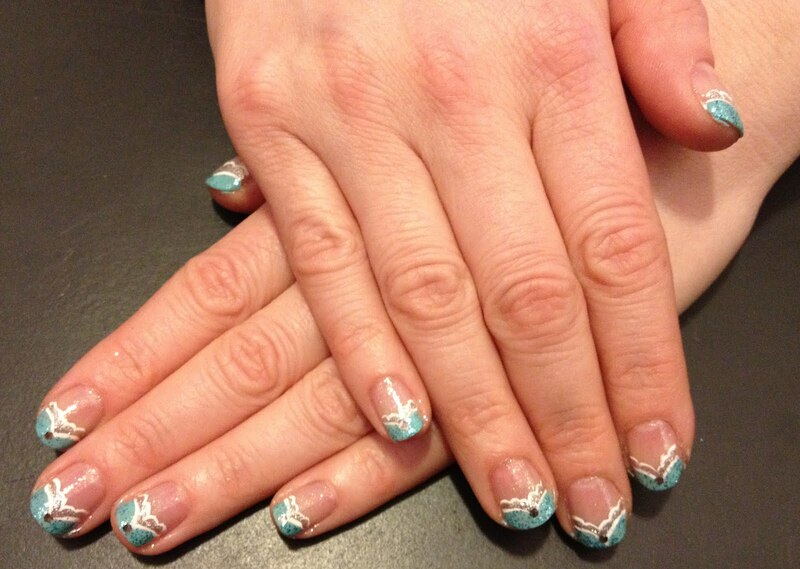 Daniella very carefully outlined the blue and then drew scallops underneath using Mattese Elite White Nail Art Paint. We liked that this nail polish had a thin-tipped brush, making it much easier to do detailed art. The scallops represent the scalloped lace tiers underneath the ballgown. 4) Daniella filled in the space between the blue and white with Milani Art of Silver. Again, we just wanted to add dimension here and make the two colors stand out more against one another. 5) We finished with one coat of OPI Gone Gonzo!, a blue glitter from this year's Muppets Collection. This made For Audrey look more blue instead of teal. Daniella was careful to only use the small flecks of glitter in the polish instead of the big silver chunks. 6) For the grand finale, Daniella carefully picked out the big, square pieces of glitter from Deborah Lippmann Marquee Moon and placed them into the center of the nail tip. I am so in love with this manicure and am completely indebted to Daniella for her artistic skill and willingness to spend almost two hours doing my nails! Now on to Disney World!